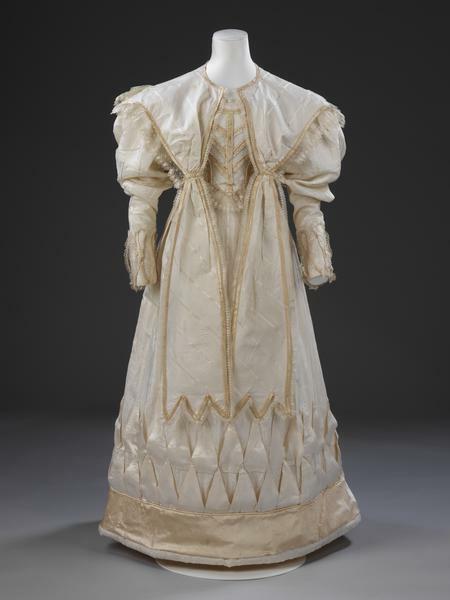 This wedding dress was worn by Eliza Larken for her marriage to William (later 6th Baron) Monson at St. Giles in the Fields Church, London, on 8 May 1828. Eliza (d. 1863) was the youngest daughter of Edmund Larken of Bedford Square, who was employed by the East India Company. William John (1796-1862) was the son of Colonel the Honourable William Monson and Ann, née Debonnaire. The Monson family estates are in Lincolnshire. In choosing white for her wedding dress Eliza was making a fashionable choice. Although white and cream were worn for weddings in the 18th century, it was in the following century that white became the colour to which brides aspired. Eliza's dress was made with a pair of detachable long sleeves which fit over the short puff sleeves. These would have been worn for the wedding and made the dress suitable for day wear. Worn without the long sleeves, it was transformed into evening wear. The dress also has a matching pelerine - a short cape which is extended at the front with narrow lengths of pendant fabric. The dress is made from white silk woven with a narrow and a slightly broader satin stripe and figured with small floral sprigs. The bodice is lined with cotton and the sleeves are lined with stiffened cotton net. The bodice has a wide shallow neckline, short puff sleeves and a slightly raised waistline extending into a 'V' at the centre front. The bodice is cut with a front panel, shaped with bust darts from the waist, two side panels and two back panels. It fastens at the centre back with a narrow cotton tape at the waist and five metal hooks and eyes. The bell shaped skirt is made from four widths of silk pleated into the waistband at the front and gathered into the waistband at the centre back. The neckline, sleeve ends and waistline are piped with gold-coloured satin; the same fabric, arranged into narrow pleated bands and placed to reflect the shape of the bodice, is applied to the centre front; similar bands are applied vertically to the back of the bodice on either side of the fastenings. The sleeves are trimmed with white satin ribbon shaped into V-shaped petals; the same ribbon shapes, arranged in two tiers, are used to decorate the lower part of the skirt above a broad band of gold satin. The hem of the skirt is padded. A white satin bow has been attached to the waist at the centre back. 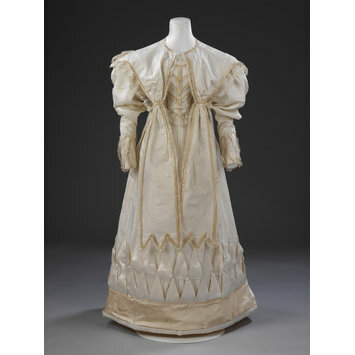 The bodice is trimmed around the neck with a narrow band of hand-made silk blonde lace, and on the front with a broader band of hand-made silk blonde lace, which may have been added later; the sleeves are trimmed with two flounces of machine net, finished with hand-made silk blonde lace, which were added a few years after the dress was made, ca. 1830. These lace flounces have been removed. The sleeve ends are trimmed with a further narrow band of hand-made blonde silk lace, which may also be a later addition. A cotton tape, inscribed 'MUNSON' in black ink has been stitched to the inside waistband. The matching pelerine is made from the same striped and figured silk, partly lined with plain white silk. It is made of a back piece and two fronts joined at the shoulders, with two lengths of silk, which widen towards the zig-zag ends, attached at the centre front edges. The shoulder seam is piped. All the edges are bound and piped with gold-coloured silk satin and finished with the same narrow blonde lace that has been used to trim the neckline of the dress. There are also two full-length detachable gigot sleeves which make the dress suitable for day wear. They are made from the same silk as the dress, cut on the cross, and are lined with white cotton. Both ends are piped with pale gold coloured satin; the cuffs are decorated with satin bands of the same colour to a depth of 15cm and finished with hand-made blonde lace. The sleeves fit neatly over the integral sleeves and fasten with a hook and eye. 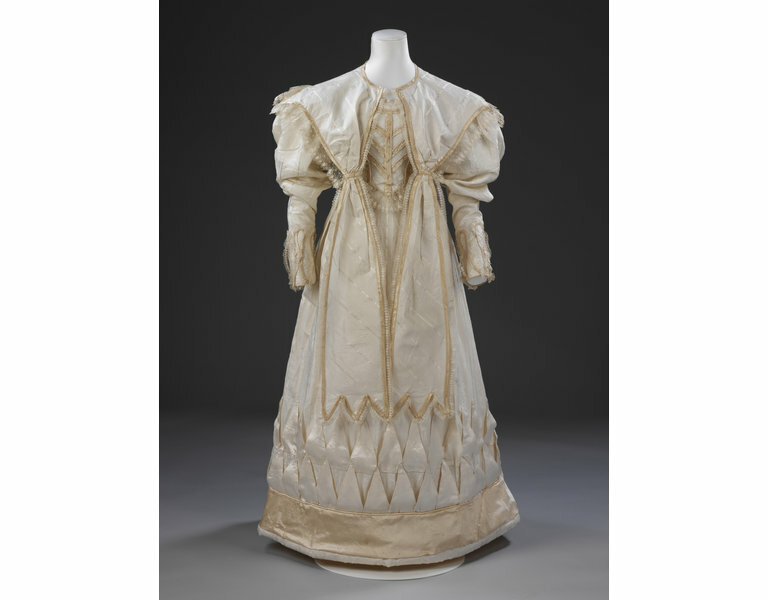 This wedding dress and matching pelerine were worn by Eliza Larken for her marriage to William (later 6th Baron) Monson at St. Giles in the Fields Church, London, on 8 May 1828. Eliza (d. 1863) was the youngest daughter of Edmund Larken of Bedford Square, who was employed by the East India Company and worked in the tea trade. From 1804 to 1808 he was based in Canton and Macau. William John (1796-1862) was the son of Colonel the Honourable William Monson and Ann, nee Debonnaire. The Monson family estates are in Lincolnshire. White silk wedding dress, trimmed with pleated bands of gold-coloured satin, white satin ribbon, hand-made silk blonde lace, with a matching pelerine; London, 1828. Eliza Larken wore this dress to marry William (later 6th Baron) Monson at St Giles-in-the-Fields Church in London on 8 May 1828. The dress has short sleeves but it has been displayed with the matching over-sleeves worn by the bride to make it suitable for a church wedding. She completed her outfit with a net cap trimmed with lace.